The Academy appears to be taking off. We have over 30 JHS1 students starting next month, including half a dozen new prospects that found us through word of mouth (some of our students are doing very well in school) or from our new website. Our new fluency-based curriculum is ready for testing. We’ve rented a second reading classroom and are buying a lot of new books. We haven’t reached 100 students yet (how naive that goal seems now) but we’re getting closer. We should definitely hit it next year if not before. More importantly, we have learned a lot over the last few months and should be able to improve class content and avoid operational issues next year. A few big changes next year. The biggest is that I’ll be teaching all the junior high school classes, both input (reading) and output (communication). I’m doing this because I want to really work on the curriculum and trial our new fluency materials. We will have over fifty JHS students from April. We’re increasing class sizes. Until now we’ve had output classes of six, but from April we’ll have up to ten students in a class. I think this should be okay, but I’ll have an assistant for each class just in case. For input classes with the new classroom we’ll be able to increase our max class size from 12 to 22. We’ll be trialing our new fluency materials with thirty JHS1 students. Limited trials so far seem to indicate that the materials are interesting and easy-to-understand for students. We’ll see how they do over an entire academic year. We’ll finally have some student manuals that explain the program and what students should be doing in Japanese. Based on my experience of using manuals with university students I expect this will make things more efficient. It will also help parents to understand what we are doing and why. We’ll be making some administrative changes too to reduce friction and paperwork. The most important is that I already know what days of the week will be JHS1 classes from April 2018. This means we can tell parents about them sooner and have them sign up in January for classes (first come first served). We’ll be asking them to pay the annual fee in order to register, which should reduce sudden cancellations (or at least compensate us somewhat for them). We’ll be buying a lot of books. I just ordered 300,000 yen’s worth of books for our YL0.1-0.2 library (to deal with those 30+ JHS1 students coming in next month). This will last us a few months, but then we’ll have to make a similar order for YL0.3-0.4, and so on. It looks like 30 is going to be our capacity for a while, so this should be a one-off this year. I also expect to continue buying intermediate level (YL1.1+) books to expand our collection. We rented a second reading classroom this month, and will be using it for the JHS1 classes. 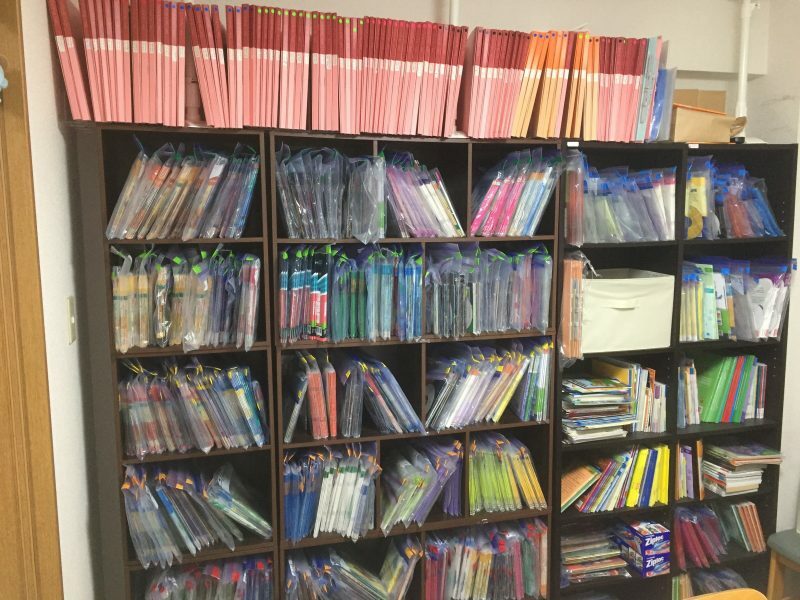 We’ll keep our current classroom but move the lower-level materials to the new classroom and keep the old one for older students. So things are looking good. Growth is slower than I was expecting, but seems to be taking off. Next year should be a big improvement in class quality and I’m hoping to document what I do to make it easier to have other teachers run the classes. We intend to trial our JHS2 fluency materials in 2018 and JHS3 in 2019. Finally, I think I have figured out how to share the Academy program with other schools. We are creating something called the Academy Mentor Program (AMP) which is basically a time-limited franchise (schools stop paying fees after a few years and can continue using the program). I think it’s a win-win-win. If all goes well we’ll be doing a Beta in 2018. Anyone else doing interesting things with junior high school students? Would you be interested in getting support/materials/knowhow to launch your own Academy program? Any good books in the YL1.1-3.0 range? Last year I took another look at the excellent Cambridge Discovery Interactive Readers (full review coming soon) and was disappointed to see that a lot of the content was set up to be accessible to a single user for a limited time. It seems the publisher assumes they will be bought by individuals and used as a kind of textbook. Of course, this is very different to how ER program administrators look at books. For me, I am not interested in the interactive questions or even videos (although it would be nice if they were on a public site accessible by anyone), but I am very interested in having the audio files available so I can make CDs for our students. I reached out to our local Cambridge University Press rep, who is a very thorough and approachable guy, and told him I was very interested in having access to the audio files. He asked some questions about my teaching situation, I answered them, and he said he’d talk to the main office. I assumed that would be the end of it. Few publishers understand ER as practiced in Japan (particularly with regards to the importance of word counts, etc.) and I wasn’t expecting much more than ‘sorry, we can’t do anything at this time’. This morning I was proved completely wrong. I received an email telling me that the audio files for the first couple of levels are online and can be freely used by teachers and students. Apparently the rest of them will be going up soon. This is great. 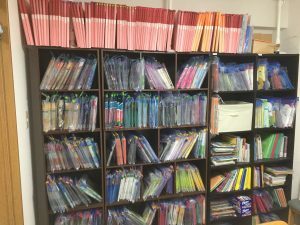 I’m really happy to see a big publisher listen to local teachers and help them with their teaching situation. 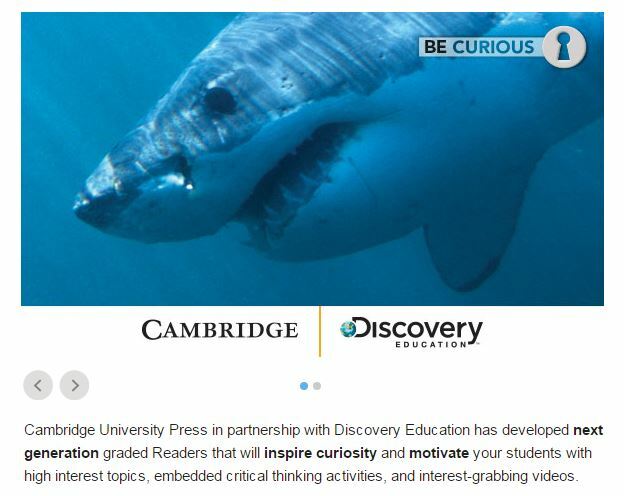 Big kudos to Cambridge for making this change -I hope you’ll check out the series and download the audio. Positive reinforcement works wonders! I’ve been meaning to write this post for a while. 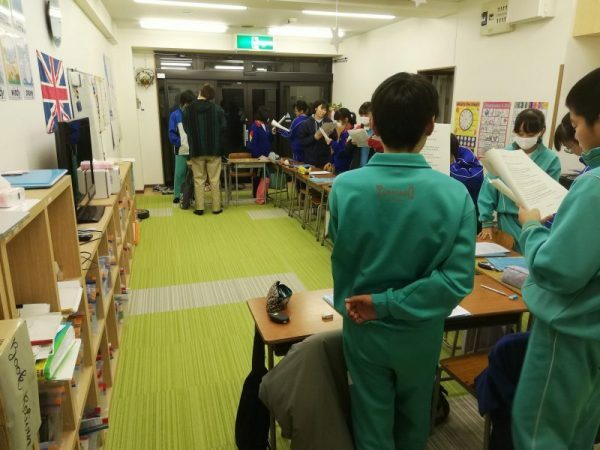 I’d like to thank Yuko Suzuki, who first told me about the huge potential of incorporating shadowing practice into extensive reading classes for beginners/lower-level students. If you have a chance to see one of her presentations I recommend you take it -she’s a very effective teacher and presenter. Shadoku is shadowing and tadoku (extensive reading). Shadowing is a type of speaking fluency practice that involves attempting to speak along with another person or an audio source. It is different from repeating. When doing read and repeat, for example, the source would speak first, then the learner would repeat. In shadowing, the source would speak, then the learner would attempt to say the same thing at the same time with the smallest lag possible. One feature of shadowing is that learners are encouraged to imitate the speaker’s tone, intonation, emotion, and pronunciation. This video gives a brief explanation of shadowing. So how does this work with tadoku (extensive reading)? Well, I have only been experimenting with this for a few months, and we rolled it out to all the beginner students in the Cambridge Academy last week. I have adapted (messed up?) Yuko’s technique slightly, so I will introduce my version of shadoku below. For beginners (mainly junior high school first years and elementary students) I am planning to do shadoku as described below until they reach YL 0.4, at which point I may allow them to read and listen instead, or we may continue with shadoku if that seems appropriate at the time. Basically this year is another learning experience for me. 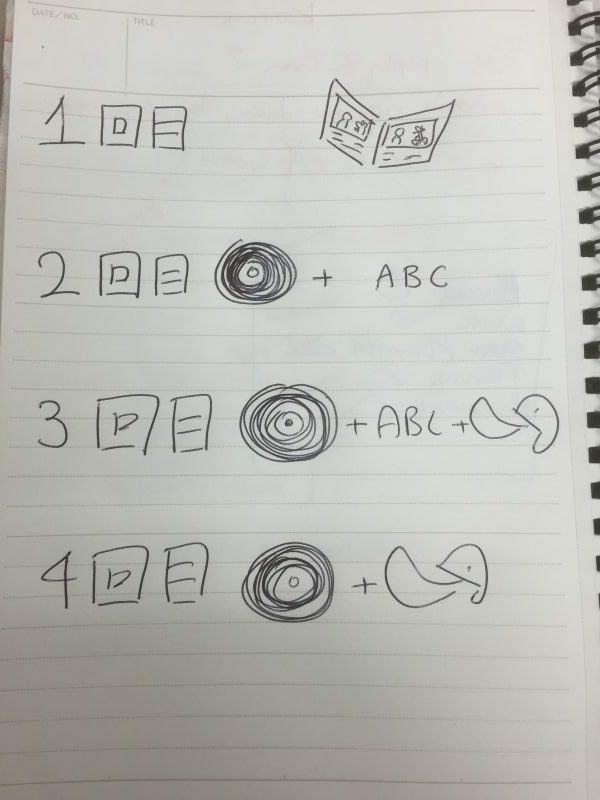 There are four steps in my version of shadoku, so a student will read each book four times. Step one: look at the pictures, think about the content. At YL0.1-0.3 there are plenty of pictures in the books and students can guess a lot of the content just from that. This step takes a minute or two, and we encourage students to look closely at details in the pictures. Step two: listen to the audio and read along silently. This step allows students to focus on how to pronounce words and how the English sounds when spoken. Step three: listen to the audio, read along, and shadow out loud. 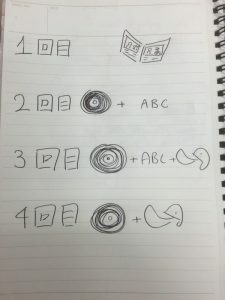 This step allows students to shadow assisted by the text. Step four: listen to the audio and shadow out loud. Do not open the book. This step allows students to use their listening skills and short-term memory to shadow successfully. I also encourage students to think about the meaning of what they are saying during this step. For the first three or four classes I have students do shadoku as a group, with me leading them. I introduce each step (I have a notebook with the four steps that I show to remind students), play the CD when necessary, and give students feedback and advice. Students shadow together as a group, which makes them feel less self-conscious and allows more confident/keener students to set a good example. 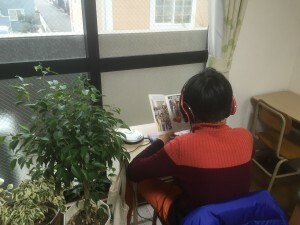 After a few classes and once students are more confident, we do group shadoku at the beginning of class and then students work individually with headphones and personal CD players in the latter half. They are also expected to continue practicing in the same way at home. I haven’t been using shadoku with my students for long, but already I am really happy with how things are going. I’ve been asking all our new students (starting at YL 0.1) to do shadoku, and am currently planning to have them continue until they reach YL 0.4 or so. The main benefit is that students are much more involved in the task. Previously when we did reading while listening some students were clearly zoning out. I had a couple who appeared not to have made any progress mid-year so I had to have them go back to the beginning and do intensive work reading to me, etc. I can’t see that happening this year, as I can hear the students practicing and can monitor if they are getting the right pronunciation, intonation, etc. The students also seem happier and the atmosphere in class is much better than last year. This is still a work in progress. So far so good, but we’ll see if students get bored or some unexpected problem pops up. We’ll also have to see where it would be appropriate to stop doing shadoku in class and transition to reading and listening. I suspect it’s going to be when students move from YL 0.3 to 04, but I’m not sure and look forward to trying it out in a couple of months’ time. Anyone else using shadoku? Anything to add? Japan Times article. NHK puts a positive spin on the data. Less positive commentary. Apart from unsurprised disappointment, my first reaction is to question what exactly the government thinks the equivalent of Eiken 3, pre-2, or 2 writing skills are that 40-odd percent of students have (given that these tests don’t have a writing section). Is it that ridiculous ‘rearrange these words in the right order’ section? Because if they were using the words ‘writing skills’ in the form that the rest of the world understands, I think it would be a struggle for any Japanese junior and senior high school students to demonstrate proficiency. I don’t think a huge amount has changed since I wrote those. One thing that has changed for me is seeing how effective an extensive reading and listening course is. I will be doubling my efforts to get local schools to start their own programs -wish me luck.